The TEH 2724 / 30C is a compact body with a footprint of 1 square meter or less and a height of 1.4 m, but with a CCD camera, it is possible to implement high precision and high speed device mounting by image processing using control software. 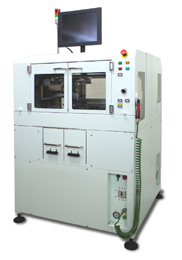 High productivity of 1,000 UPH has been realized with 3.6 sec / device transfer. * Including image processing time. Tray transfer time is not included. Depends on target device, tray. * TEH2724 is available with 2 million pixels as an option.